Dunmore is one of the world's leading manufacturers of photovoltaic backsheets used in the production of solar panels. DUN-SOLAR™ backsheets are available in various constructions. The DUN-SOLAR TPE backsheet and DUN-SOLAR TAPE backsheet are a proven and reliable backsheet component used by many solar module manufacturers. DUN-SOLAR TPE backsheets have a high performance three layer construction with a Tedlar® polyvinyl fluoride (PVF) layer applied to a polyester core and a PE film for superb electrical, physical, thermal and barrier properties. DUN-SOLAR TPE backsheets protect PV modules from UV, moisture and weather while insulating the electrical load of the modules, which can operate up to 1000 VDC. These DUN-SOLAR TPE capabilities are essential for functionality and longevity of the photovoltaic modules and safety of people who work with and near the PV module. 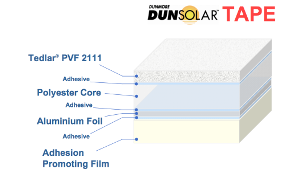 DUN-SOLAR TPE is a DuPont™ Tedlar®-based product. Tedlar® is traditionally well-regarded for its fluorinated film performance. DUN-SOLAR TPE is a multi-layered film lamination designed to be used as the backsheet for photovoltaic solar panels. It acts as a durable protective barrier for the electronic components found in solar panels. This construction is specifically engineered for use in photovoltaic backsheet applications requiring superb electrical, physical, thermal and barrier properties. DUN-SOLAR TAPE is a Tedlar® backsheet similar to the TPE product, but it includes an aluminum foil layer in the Tedlar® PV backsheet laminate. It is specifically designed for thin film CIGS modules. The total thickness of the construction is 425 microns and provides excellent moisture barrier properties. The water vapor transmission rate (WVTR) for the aluminum foil based Tedlar® backsheet is <0.0005 g/m2/day. DUN-SOLAR TPE backsheets are UL recognized under file QIHE2, Photovoltaic Polymeric Materials-Component. All DUN-SOLAR backsheets are certified by TÜV for Partial Discharge. Their low shrinkage in vacuum lamination provides bubble and wrinkle-free modules. Dunmore's ISO 9001:2015 certified manufacturing facilities ensure that products and systems meet the high quality standards required by the photovoltaic industry. Please Contact Us for more information on DuPont™ Tedlar®-based DUN-SOLAR TPE backsheets and TAPE backsheets for solar module manufacturing.